Buddy is an up and coming rapper from Compton, California, who began recording music back in 2009 when he was just a teenager. He was soon signed Pharrell Williams’ label, and began releasing several singles, and mixtapes featuring collaborations with artists like Kendrick Lamar and Miley Cyrus. This led to Buddy gaining a lot more visibility. His latest song, “Hey Up There” is the first single from his new album, Harlan & Alondra, and is all about his rise to stardom. It features a verse from fellow LA rapper Ty Dolla $ign, and was accompanied by a music video upon release, which quickly rose up the YouTube Trending page. Buddy wears black high top chucks throughout this video. This song is a celebration of Buddy’s success through music, and all the highs that come with it. He muses on where he started out, and how now he’s finally making some money to take care of his “day ones”. He doesn’t necessarily care for the fame, but it’s the price you pay to care of those who matter most. He likens this new found recognition to hitting a mine because he’s about to “blow up”. Musically, the song is very upbeat and bouncy which makes it easy to bob your head to. Buddy’s flow is unique and fits in with the beat and Ty Dolla $ign very nicely. Buddy up above his peers, symbolizing how far he’s come up in life. 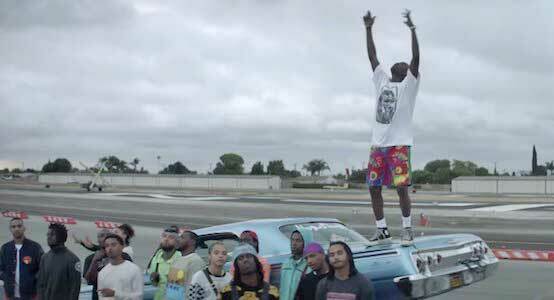 The music video starts out with Buddy overlooking the city of Los Angeles, which is intercut with shots of spots in LA and Compton. Ty Dolla $ign performs his verse on a colorfully lit runway, which is a very fitting setting for the message of this song. It also ties in to the multiple shots of helicopters and planes in the video. Buddy dances on a baby blue lowrider while wearing a pair of black chucks that really stand out against the car’s bright colors. This lowrider is also a perfect vehicle for the message of being lifted up, as Buddy stands on the lifted end of the car over his peers. It’s a very visually impressive video with some subliminal messaging that meshes very well with the song’s lyrics and melody. Even on the ground you gotta stay up. Use the links below to get yourself a new pair of chucks to celebrate your success.